There is a joke I heard years ago about an elementary school teacher who was teaching a unit on religions. For show and tell day, she asked her students to bring in a religious artifact that symbolized their family's faith. The appointed day for the presentations came and the students were excited to share. One of the girls volunteered to go first. She came to the front of the class and proudly announced, "I'm a Roman Catholic and this is a Rosary. We use these to help us when we say our prayers." "Very good," said the teacher. Then she asked who would like to go next. A little boy was next and he had a small candelabra with him. "My family is Jewish," he said, "and this is a Menorah. We light one candle each night during Hanukkah to remind us that God gives us what we need." "That is very nice," said the teacher. Then she asked who would like to go next. A little girl came to the front of the class and enthusiastically announced, "My family is Methodist and this is a casserole dish!" Now I could relate to this. When growing up, my home church had so many potlucks that our family actually had a set of dishes and plates that were just for potlucks. As I have had the opportunity to visit and worship with many of our churches in the Illinois South Conference of the United Church of Christ, a commonality that all our churches share is that we know how to eat. When we come together, often there is a meal, and we should not be ashamed of this. Eating together is an important part of shared life together and it always has been. It may be one of the most important things we can do together. In Jesus' day, eating was not as simple and certainly not as unifying as it is today. In Jesus' day, eating together was filled with certain rules, social roles, and expectations, which revealed the inequality, the injustice, and the imbalance of power, authority, and wealth in the world. In Jesus' day, at public meals persons with the greatest power were seated at the front, served first and would only sit with those they believed to be of equal worth and status. "Eating was for Jesus a key means by which he proclaimed the coming of God's reign and acted, or enacted, its arrival." 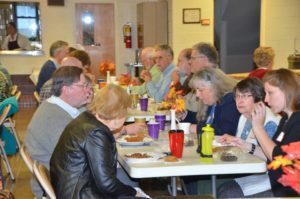 Jesus' "table sharing" modeled how meals can be experiences of connection, and blessing. Sharing a meal can be a way to break down barriers, to get to know someone behind mere appearances and labels, and discover the presence of the Holy in one another. This was and still IS a radical idea. I believe there is a transformative power in sharing a meal with someone. It is easy to misunderstand, judge or even hate someone from afar; it is much more difficult to do this close up. Eating together provides an opportunity to be up close and personal with others. It can be a vulnerable act in which we will be challenged to move beyond mere small talk to true sharing and connection. When we are willing to sit across the table from someone that is different than us and share in a meal and meaningful conversation, more often than not we will discover we have more in common than we first thought. The next time you are at coffee hour, a church dinner or a banquet at which you can choose where you sit, choose to sit next to someone you don't know, someone with whom you think you have very little in common, someone with whom you disagree, or someone whom you are convinced you would not like. As you sit across from that person remind yourself that you are sitting across from one of God's own beloved, one of God's own beautiful creations. Share the meal with them and share a sense of welcome, openness, curiosity, and acceptance. Get to know them. Ask questions. Listen to their story and be willing to share your own. In this practice of "table sharing," I imagine you and the person across the table will be surprised by the connections you will make and the blessings you will receive.